Has your business hopped on the Slack train yet? As of May 2018, Slack claimed to have over 3 million users across 70,000 paid teams and 10 million total users each day. Even if your business isn’t large enough to need a messenger app to communicate, there are many opportunities to benefit from Slack channels as inbound marketers. As inbound marketers, our role is to produce content that is valuable to buyers, educate them, and engage them as they are making an important buying decision. We produce content on all types of platforms like websites, blogs, social media, email, etc. to help consumers make these decisions. If our job is to think outside the box to solve issues for our consumers, then we should also think outside of the box to solve our own issues. One way is by joining industry Slack communities that relate to our roles. We will dive into what Slack communities and channels are, why we should be active in them, and some of the best channels to join. What Are Slack Communities and Channels? A Slack community is a workspace created on Slack for like-minded professionals to come together and talk about a specific topic. Each community is usually based around a specific subject. For example, in the context of this article, that subject may be digital marketing, inbound marketing and sales, design and development, and so on. Not only can you find a community focused on specific topics, but you can also likely find one that is for your specific role. Let’s say you’re an account manager for a company in the state of Connecticut and want to connect with other marketing account managers throughout the state, there’s likely a Slack community for you -- and if not, you can make one! Why Should Inbound Marketers Join Slack Communities? Now that we all have a better understanding of what Slack communities are, why are they important to us as inbound marketers? There are four main reasons you should join them. These Slack communities aren’t only a great way to learn more about a specific topic, they’re the perfect setting to connect with other marketers like yourself from all around the world. We’re all busy with our job responsibilities and maybe don’t have time to go out to networking events to make new connections. By joining a Slack community, you can become a part of a close-knit group that works together to make each other better marketers from the comfort of your own home or office. Connecting with other inbound marketers through these communities is a great way to develop new partnerships, maybe find a future teammate, and give and receive feedback on campaigns and projects that members are working on. The biggest benefit I’ve seen since I started using Slack a few years back is how instantly helpful community members are. How many times have you been stuck on a project and needed a fresh perspective? Slack communities offer that! When another member has an issue or needs feedback on a project they are working on, there is always someone jumping in to try to solve the issue in the best way they can. What could have taken you hours of your time and possibly hundreds to thousands of dollars to discover on your own could be easily solved within one Slack thread. The same goes for questions. If you have a question that someone on your team or even Google can’t seem to find an answer to, throw it out to your Slack community. With our time and money as extremely valuable resources, who can honestly say no to simply asking your question to a huge, diverse group of experts? There are many inbound marketers out there that do not have the opportunity to collaborate and run ideas by someone before finalizing their project because of their company structure. I’ve learned firsthand that by not working as a part of a team, we could be missing out on ideas that could make that project even more successful. By joining a Slack channel, all marketers, despite their company’s structure, can collaborate with others and get other ideas to produce the best results for their company or their client’s company. From an inbound agency perspective, Slack isn’t only a great way to collaborate and connect with other marketers, it’s also the perfect opportunity to learn and get inspired. As mentioned above, people are always asking/answering questions and sharing information in Slack communities. There’s so much you can learn by consuming this content. They always create a great chance to educate others, become a thought leader in your industry, and maybe attract potential customers by educating them with your content. Our main role as inbound marketers is to educate others to make the best decision in their buying process. You never know when that blog article you read a few years back, or one that wrote yourself last month, can help other marketers solve their problems or reach their goals as well. Although we do want to be as helpful as possible with content, it’s important to not be “that guy” that spams the channel with their latest article or pillar page content every day. Remember the purpose of these Slack channels is to engage, collaborate, and educate. So keep this in mind when communicating with other members and try not to be too self-promotional. As one of the largest Slack communities for marketers, OnlineGeniuses is one of the first you should join. Their channels discuss everything from SEO to email marketing to CRO. Although it is free to join, you have to apply to do so. They properly vet all of their applicants to ensure that any applicants are the right fit for the group. It may take a few weeks to get approved, but it will be worth it when you get to collaborate with some of the top digital marketers in the world. The term “growth hacking” has become common for inbound marketers. If you are a growth marketer or are simply trying to learn more about how to grow your business and increase lead generation, this is the right channel for you. You can discuss your strategy ideas with thousands of experts. Traffic Think Tank is one of the top Slack resources to use if you are searching for more information on SEO from industry experts. Since it is a paid resource, there is more privacy and a better opportunity to connect with experts. Traffic Think Tank also has Q&A sessions, webinars, and over 300 hours of content that is exclusive to paying members. Another channel for those who’d like to gain a deeper understanding of SEO is BigSEO. This channel goes into the latest SEO trends, any algorithm updates, and much more. A few of the channels you can view are #localseo, #technical-seo, and #penalties. If you’re looking for new ideas on a backlink strategy join the #Backlinks community. There are SEO experts, industry leaders, and other marketers discussing ways to increase backlinks to your site. The members work together to find the right backlink opportunities for those that need help promoting their content. This free Slack community is the go-to for analytics-driven inbound marketers. The Measure community has channels relating to Google Analytics and Tag Manager, Adobe Analytics and DTM, helpful blogs and podcasts, different conferences to attend, and more. The creator of this channel even put together a helpful slide deck to explain how to use Measure on the Learn tab of their website. This Slack community is the best place for affiliate marketers to discuss everything from PPC, PPV and marketing tools to any relevant news to this industry. There are also a lot of helpful resources to help affiliate marketers grow their skills and improve the campaigns they are working on. 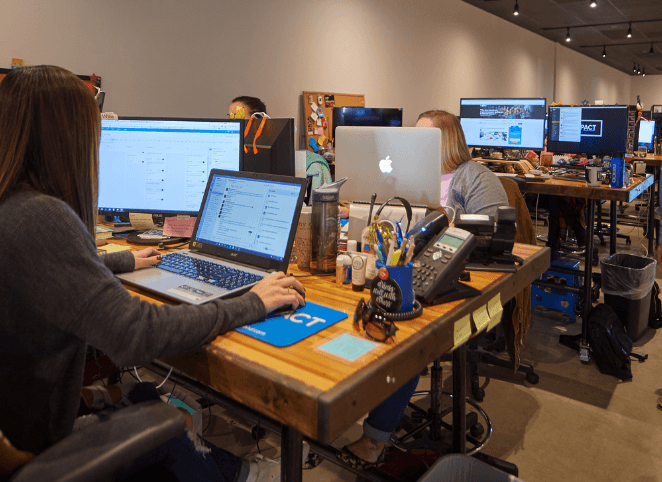 Last year, HubSpot moved from the old funnel model to the Flywheel to show the importance of connecting marketing and sales with customer service to ensure customers were happy. With this in mind, the Customer Retention/Happiness community is a great place to learn different strategies and methods to increase your company’s customer retention rates. Even if you don’t work directly with customer service, this community can help inbound marketers gain a better understanding of their customers. As marketers, we often need to come up with creative ways to educate ourselves on different aspects of our roles. By joining any of these communities you can connect with inbound marketers from around the world, get almost instant feedback on your work, collaborate with some of the top industry experts, and educate yourself and others through helpful content. Just remember to be as helpful to others as they are to you. Don’t just promote your content. Want to get even more out of Slack? Check out these handy Slack integrations to use for marketing. Do you have another Slack community that would be a good fit for inbound marketers? Feel free to reach out in IMPACT Elite with the name of the community!